When I was 6 years old, visited Haridwar during Diwali festival. The year may be 1988. there I had Gujiya for the first time, from a very old shop near Harki Pouri. Along with Halwa Puri. I still can remember the ghee fried dry fruit loaded crunchy but melt in mouth Gujiyas. Never had such Indian delicacy after that. But after that, I again tested this in Texas USA, from a Gujrati sweet shop named Royal sweets. But the taste was not that great, it was ok type. I was planning for making this since I've started my blog. But somehow, couldn't make it. But this year, and specially for my YouTube channel, decided to make this, but the baked version. And guess what, it turnd out super delicious. I've tried this authentic Gujiya recipe with a Bengali touch, I've made the stuffing using Nolen gud and baked the Gujiyas to make them healthier. But you can deep fry too as per the traditional procedure. Let's check for the recipe, and for details steps see the video. And don't forget to subscribe our channel for regular updates. Gujiya is a very popular Indian sweet, it's also known as Karanji, Paraki, Chandrakala, Ghughra, Purukiya in other parts of India. But the most popular name is Gujiya. Gujiya is a half moon shaped sweet but crunchy dumplings filled with sweet mawa or coconut based stuffing. In the stuffing, lots of dry fruits are added, sweetened with sugar or gud. The outer part is made with Suji/semolina or refined flour or whole wheat flour. Deep fried dumplings in clarified butter or sunflower oil and soaked in sugar syrup. Sometimes soaking in sugar syrup can be avoided too. 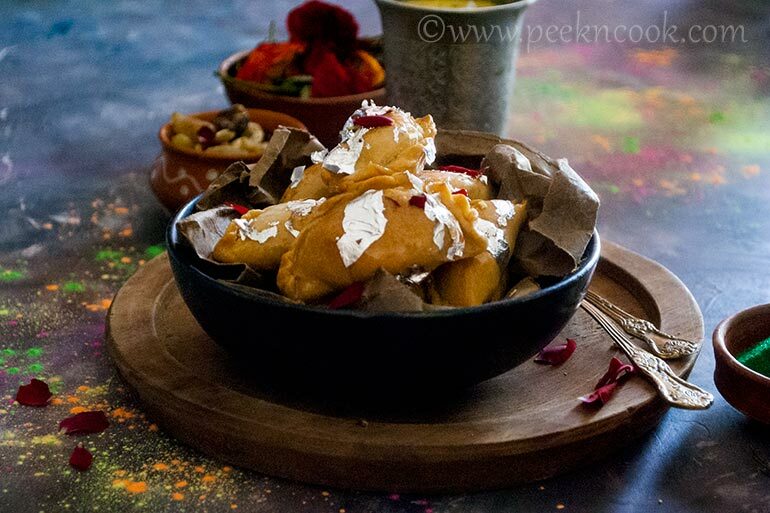 these Gujiyas are decorated with silver warq, chopped pista, dried rose petals and saffron thread. This special sweet is popular all over the country. This sweet is made during special occations like Holi or Diwali. But mostly in Holi Gujiya and Thandai are must for any Holi party. Take a bowl, add maida, ghee, salt & baking soda and mix well. The texture of the maida will be like crumbly. Now add water little by little and make firm but smooth dough. Now cover the dough with a dump cloth and leave it for 20 to 30 minutes. Take a pan, heat ghee, add mawa & gud+sugar. Mix them well on low heat. Now add scrapped coconut & nutmeg cardamom powder and mix with the mawa. Turn off the gas & mix the dry fruits with the mawa, gud, coconut mixture and keep aside for later use. Take a sauce pan, add sugar, water & saffron and bring it to boil. Boil it for 5 minutes till it comes to one string consistency. Turn off the heat and keep aside it too. portions. And if you wish medium size Gujiyas then make 10 equal portions. corners in such a way that it secures the stuffing, while frying the Gujiya. For sealing you can use a fork and press the edges. for details procedure you can check the video. Roll the sides as per your choice of pattern. I've shown 2 ways of sealing method. In the same way, make rest of the Gujiyas, and keep them under an dump cloth, to prevent form forming skin on the Gujiyas. Now preheat the oven on convection mode for 200 Degree Celsius for 2 minutes. Brush a baking pan with ghee. Place the Gujiyas on the pan, apply ghee on the Gujiyas too to prevent them from drying. Bake the Gujiyas for 15 to 20 minutes. But after 12 minutes check if they are ready or not. Every oven is not same. In my oven it took exactly 17 minutes to be baked perfectly. If you want to deep fry them, then melt ghee in a deep pan on low heat & add the gujiyas into the melted ghee, now on low heat fry them the make them perfectly crispy & crunchy Gujiyas. When they are nice golden in color take them out of the pan & place on paper towel to absorb the excess ghee. Now let them cool down completely. In the mean time warm the sugar syrup, and add the Baked/Fried Gujiyas into the syrup. Rest them for 2 minutes on both sides, each sides 1 minute, and take them out of the syrup. Serve at room temperature with Thandai in any occasion. You can add only sugar, You can use only mawa or coconut. Saffron can be added in stuffing.